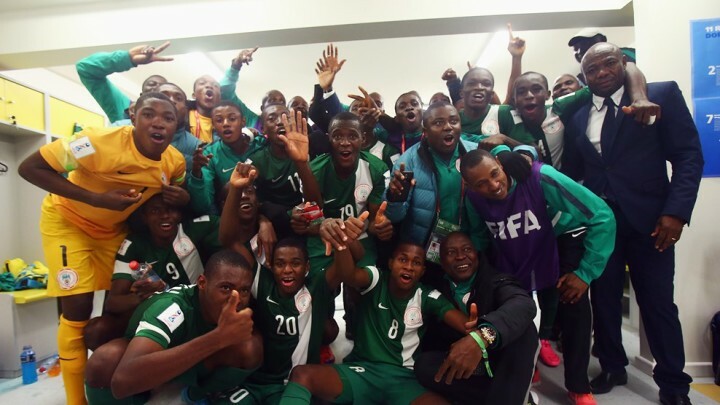 Nigeria Golden Eaglets and holders of the FIFA Under 17 World Cup Trophy edged Mexico 4-2 in a game described as a thriller that saw Nigeria set up an all African final against Mali on Sunday November 8 2015. Mexico opened the scoring through Kevin Magana in the 7th minute, stunning efforts from Kelechi Nwakali and Orji Okwonkwo saw Nigeria equalize and go ahead 2-1 in the first half. Diego Cortes’s remarkable solo effort leveled matters, before Osinachi Ebere and Victor Osimhen’s late record-equaling penalty saw the Golden Eaglets to a thrilling victory. A foul by a Mexican defender on John Lazarus in the Mexican penalty area, gave Osimhen the chance to score his 9th goal of the tournament and go level at the top of the all-time U-17 World Cup goalscoring charts jointly held by French Florent Sinama Pongolle and Ivorian Souleymane Coulibaly. Nigeria head to Vina Del Mar on Sunday for an all-African final against continental champions Mali while Mexico will face off against Belgium in the match for third place earlier the same day.